I always had these questions as a design beginner…. …..that how a design process would look like? What are all the steps? How things are formulated and screens take place? And I think that I got some answers today. If ever you have even slightest of interest in this UX field then you must have heard about this Interaction Design Foundation. It is one of the most active UX communities in the UX sphere and now I know why? It is because the value it brings to the sphere. 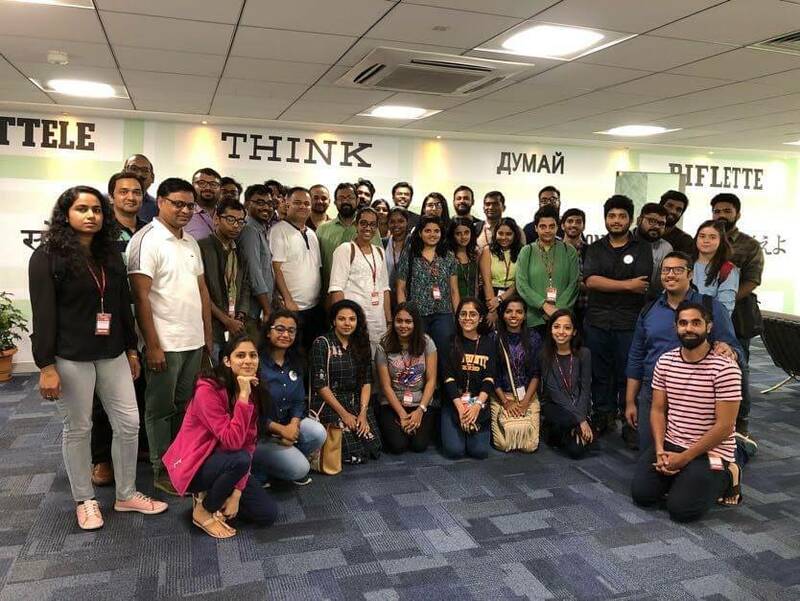 So, the event was organized by IDF as “BY THE WAY OF DESIGN THINKING” and was held at IBM Bangalore and boy o boy, what an interactive session it was. You can’t imagine almost 35 people turning up on a Saturday morning. 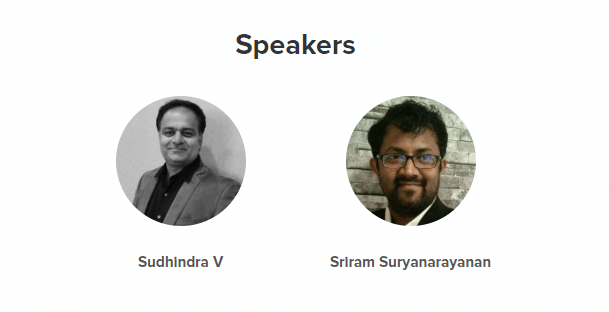 So, in case if you have missed out on this event, let me walk you through all the speakers profile first. Sudhindra V: He is the chief design officer @ IBM India. Loved the way he called himself, a designer in the first place. Sriram Suryanarayanan: He is the design director at IBM Interactive Experience. He conducted the entire workshop. Firstly it wasn’t a theoretical workshop, it was a hands-on session. Sudhindra walked us through the Enterprise design process. How the design process evolved? How they are incorporating design thinking at IBM, how design thinking can bring a cultural shift and what all work they have done in the sphere. As Sriram took the stage and told us what we are going to achieve in this session. The core and underlying principle of a Problem Statement is based on PoV (Point of View) which in turn has three elements. P.S: How might we inspire teenage girls towards healthier eating options? User -> Teenage Girls, Need -> Nutritious Food, Insight -> To grow in a healthy way. He mentioned one interesting thing and that is that you should not infer something, insight has to be there and it has to be validated by established facts, figures or stats. Also, the problem statement has to be open-ended. It should not lead you to the solution part straight away. Once we all had our problem statement ready, we were asked to read that loud and Sriram gave his insights on that. Right after that, we moved on to the persona making and empathy maps. Phase 2: Persona and Empathy maps. One learning that I gathered from there was to look for the motivation, expectation and goals aspect of the persona. These acts as hooks which we can plug into our solution to make the experience better. Once we had that in place, each team was asked to present their personas and a kind of brainstorming happened there. I personally loved the way that how doing all these things brought in more clarity to what we were trying to achieve. The third phase was the ideation phase, where we were to diverge first and then converge. Meaning that all the team members worked individually on the ideas and then we converged them all together. Even the wildest ideas are welcomed in this phase. 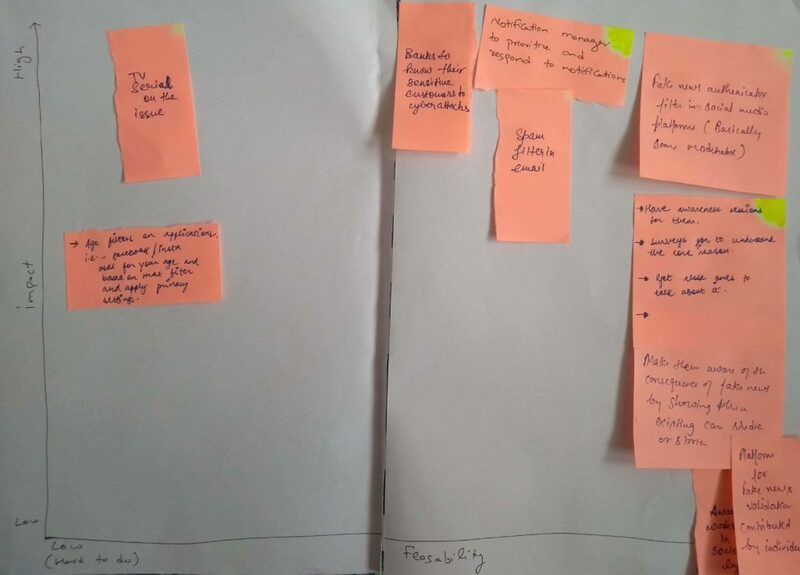 We then moved on to the Prioritization of ideas (priority grid), where we clubbed together all our ideas according to exploration, big bet, and a no-brainer. Learning: Converge and Diverge method helps in getting all the ideas and clubbing them together so that the entire design team comes to the same page. I guess, they had something more for us but time constraints were there so, we had to wrap it up with 2 random teams explaining and enacting their ideas. It was super fun and engaging. PoV -> Problem Statement -> Persona making -> Empathy Mapping -> Ideation (Converge and Diverge) -> Prioritization of ideas (Priority Grid) -> Prototyping. NoteNot sure of what would be the next step after Priority grid, so correct me if I am wrong. The UX design community in Bangalore has pretty positive vibes and we are looking forward to more such sessions. Hope we will get the part 2 of the session soon. Thank you IDF and IBM for this session. If you attended this session and think that I have missed out something, do let me know. I’ll update it here. Amazing summary. Thanks for sharing. Thank you for stopping by and leaving your words of appreciation. Means a lot. Being part of this workshop was an amazing experience. I too am looking forward to the upcoming workshop to continue where we left off. I feel you have summarized everything very well. Thank you very much Dhyanaja. Yeah, waiting for the part 2 of this session. Thank you very much. Glad that you liked it.